The graph o a function, drawn in black, an a tangent line tae that function, drawn in reid. The slope o the tangent line is equal tae the derivative o the function at the marked pynt. The derivative is a fundamental tuil o calculus for studyin the behavior o functions o a real variable. The derivative measures the sensitivity tae chynge o ane quantity (a function or dependent variable) tae anither quantity (the independent variable). For example, the derivative o the poseetion o a movin object wi respect tae time is the object's velocity: this measures hou quickly the poseetion o the object chynges when time is advanced. 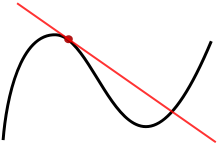 The derivative measures the instantaneous rate o chynge o the function, as distinct frae its average rate o chynge, an is defined as a leemit o the average rate o chynge in the function as the length o the interval on which the average is computit tends tae zero.